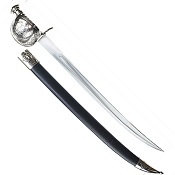 OUR NEW CUP GUARD PIRATE CUTLASS includes a scabbard with cast chromed features and an embossed cup hilt.. 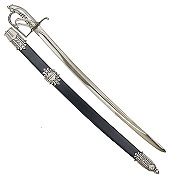 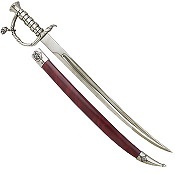 Length: 30” Weight: 3 lb, Chrome Finish Accents with Embossed Cup Hilt. 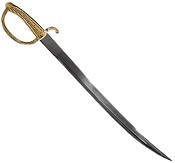 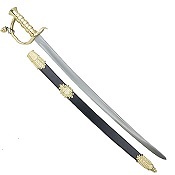 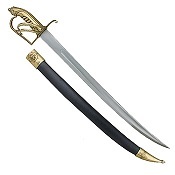 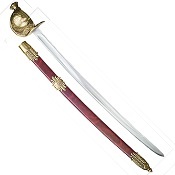 Our Beautifully Replicated D-Guard Pirate Sabre is 37.5” Long, Weighs 4 lbs and Includes a Scabbard with cast “Brass” and a cast metal skull fob.